Superstar Saga + Bowser's Minions Description A spinning shell attack! Damages all nearby foes. Shell Shock is the twelfth captain command in the Minion Quest: The Search for Bowser mode of Mario & Luigi: Superstar Saga + Bowser's Minions. It costs four CP to use. When used, the captain will retreat into their shell and spin in a spiral fashion, damaging many of the opposing squad members. However, after using it the captain will briefly become dizzy and their DEF will drop. 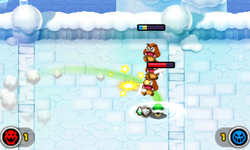 Captain Koopa Troopa, Corporal Paraplonk and Roy are the only ones that can use it. Shell Shock reappears in Mario & Luigi: Bowser's Inside Story + Bowser Jr.'s Journey, and it is a first officer command usable by Roy. After using it, his POW will increase. This page was last edited on April 13, 2019, at 19:55.